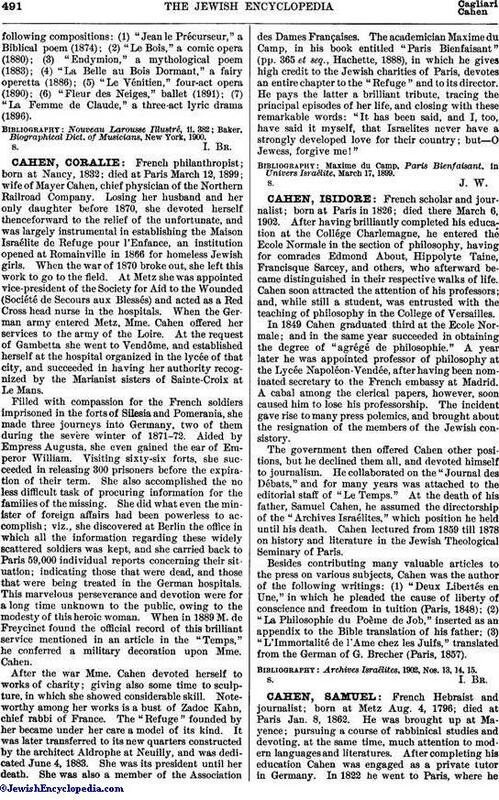 French philanthropist; born at Nancy, 1832; died at Paris March 12, 1899; wife of Mayer Cahen, chief physician of the Northern Railroad Company. Losing her husband and her only daughter before 1870, she devoted herself thenceforward to the relief of the unfortunate, and was largely instrumental in establishing the Maison Israélite de Refuge pour l'Enfance, an institution opened at Romainville in 1866 for homeless Jewish girls. When the war of 1870 broke out, she left this work to go to the field. At Metz she was appointed vice-president of the Society for Aid to the Wounded (Société de Secours aux Blessés) and acted as a Red Cross head nurse in the hospitals. When the German army entered Metz, Mme. Cahen offered her services to the army of the Loire. At the request of Gambetta she went to Vendôme, and established herself at the hospital organized in the lycée of that city, and succeeded in having her authority recognized by the Marianist sisters of Sainte-Croix at Le Mans. Filled with compassion for the French soldiers imprisoned in the forts of Silesia and Pomerania, she made three journeys into Germany, two of them during the severe winter of 1871-72. Aided by Empress Augusta, she even gained the ear of Emperor William. Visiting sixty-six forts, she succeeded in releasing 300 prisoners before the expiration of their term. She also accomplished the no less difficult task of procuring information for the families of the missing. She did what even the minister of foreign affairs had been powerless to accomplish; viz., she discovered at Berlin the office in which all the information regarding these widely scattered soldiers was kept, and she carried back to Paris 59,000 individual reports concerning their situation; indicating those that were dead, and those that were being treated in the German hospitals. This marvelous perseverance and devotion were for a long time unknown to the public, owing to the modesty of this heroic woman. When in 1889 M. de Freycinet found the official record of this brilliant service mentioned in an article in the "Temps," he conferred a military decoration upon Mme. Cahen. After the war Mme. Cahen devoted herself to works of charity; giving also some time to sculpture, in which she showed considerable skill. Noteworthy among her works is a bust of Zadoc Kahn, chief rabbi of France. The "Refuge" founded by her became under her care a model of its kind. It was later transferred to its new quarters constructed by the architect Aldrophe at Neuilly, and was dedicated June 4, 1883. She was its president until her death. She was also a member of the Association des Dames Françaises. The academician Maxime du Camp, in his book entitled "Paris Bienfaisant" (pp. 365 et seq., Hachette, 1888), in which he gives high credit to the Jewish charities of Paris, devotes an entire chapter to the "Refuge" and to its director. He pays the latter a brilliant tribute, tracing the principal episodes of her life, and closing with these remarkable words: "It has been said, and I, too, have said it myself, that Israelites never have a strongly developed love for their country; but—O Jewess, forgive me!" Maxime du Camp, Paris Bienfaisant, in Univers Israélite, March 17, 1899.